After the British army surrendered to the Americans (and indirectly to the French) at the Battle of Yorktown in 1781, the British musicians are said to have played a song with the telling name “The World Turned Upside Down.” That may be apocryphal, but when I wandered along a part of the Smith Memorial Trail on January 22 and came within sight of Bull Creek, I noticed that high up on the cliff on the far side of the creek a portion of a prickly pear cactus, Opuntia engelmannii, was indeed growing upside down. 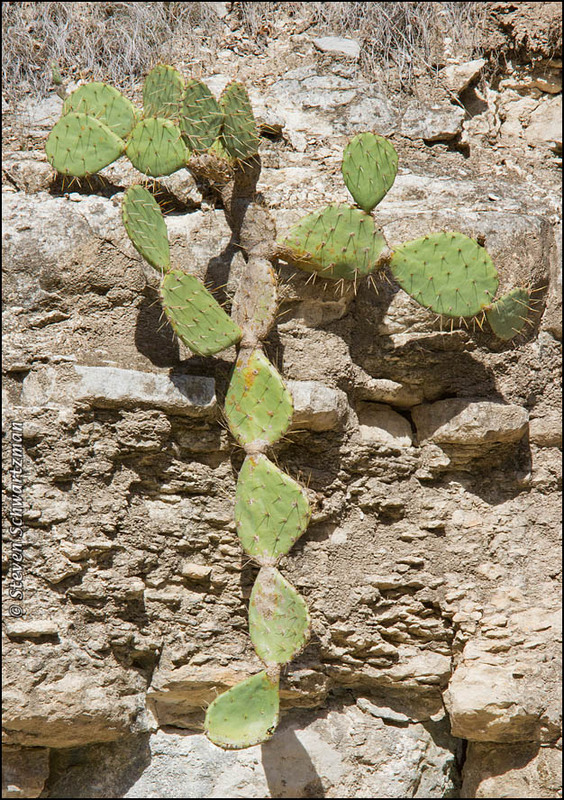 It’s often the case—as you may have seen in a photograph last September of a giant ragweed—that if a plant gets tipped over, newly growing portions of it will begin to turn and do their best to right themselves, but the central portion of this cactus seemed content to dangle off the cliff and keep growing downward. I’d originally planned this post for February 2, with some others about prickly pear cacti to follow, but the day before then, as you’ve been seeing, I found various wildflowers along Mopac and wanted to bring those to you right away. We’re not done with the (metaphorical and in one case literal) fruits of February 1 yet, but for variety I’m going to switch back and forth between the two sets of pictures this week—unless some new discovery messes up that plan too. Nature fascinates me. In WI here, I have seen people actually keep cacti in their yard. I’ve always wondered how something like that makes it each year. And here in Texas, understandably, it’s common for people to plant cacti in their yards. The prickly pear is a hardy plant, requires little maintenance, and gets by with almost no water. For a cactus to survive your Wisconsin winters is something else, but from what you say, there are species that can make it there. you’re always wandering off the trail, much to our benefit. I’m only too happy to present the fruits of my errant ways. A nature photographer who sticks to the trail is going to miss a lot of intriguing things. Thanks for visiting my blog and by so doing, introducing me to yours. Your pictures are amazing. Thanks to you too. There’s always something intriguing in nature. This is one fine photograph, and a quite unusual view of our beloved prickly pear. It looks as though the bottom pad is trying to make a bit of a turn upward, like the pair of pads canted off to the left. A wonderful image of growth and gravity in tension. Thanks for appreciating it, Linda. I, too, have wondered about that bottom pad. Since the three pads above it were content to grow downward, I’ve assumed that the angle of the bottom pad is just “natural” deflection, in the same way that we’ve seen, on cacti that are upright, a new pad grow off at an angle rather than straight up. But that’s all speculation, and I don’t know the truth. Such an interesting phenomenon, and you capture it so beautifully here. I’d never seen that phenomenon before, so I was happy to record it—and now to be able to show it to you. I love what your “wanderings” bring to your blog!